Prompt burst reactors were developed in parallel with the first atomic bombs. They were casually referred-to as “tickling the tail of the dragon.” This is because they were made to go super prompt critical and depended on intrinsic heating of the core to shut them off before they exploded. The operator completes the shutdown with rapid mechanical disassembly but that is only after heating of the core brings it down to barely supercritical. Super prompt means that the reactor is highly super critical on prompt neutrons alone and the whole burst of neutrons that results is not actually critical on delayed neutrons. Delayed neutrons come in milliseconds to seconds after fission and that is a very long time compared to the super prompt burst pulse. Most prompt burst reactors in the US were essentially the same size and enrichment as a “gun-type” nuclear bomb. So they were excellent for simulating the physics of such a device. They were also used to make all sorts of basic neutron physics measurements and one was even used to irradiate chimpanzees to study the effects of a nuclear explosion on aircraft pilots. Super Kukla was the largest such machine that was built. It consisted of five tons of 20% enriched uranium with enriched control rods that added reactivity to cause the burst, rather than a poison rod such as used in a power reactor. 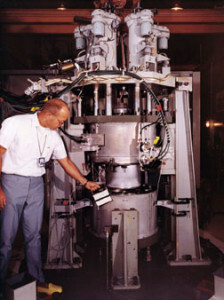 It was used to simulate the effects of Soviet ABM systems on US military hardware in a large central irradiation cavity. The power in Super Kukla could double roughly every 100 microseconds which is certainly tickling the tail of the dragon. All or most prompt burst reactors have been dismantled as the need for their basic physics experiments and damage to military systems missions have grown old. The few reports on their characteristics are becoming lost or unavailable. This is one of the few now available for the public record.